Recently I found a sub for one of my classes so that I could travel, to run with my oldest daughter in a ToughMudder event. So upon my return my regulars told me that they missed me, which is always followed by me asking how my sub did. They said, "She was okay but.... (I hold my breathe)...she said a couple of things that contradicted you." Well I guess I should give her points for trying to cue form as so many instructors totally ignore form. But for every point she earned for cuing form she loses twice as many for cuing the wrong form. 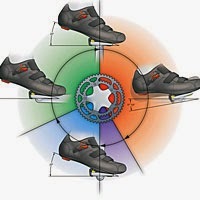 My class is used to hearing me say, "Keep your foot flat at the bottom of the pedal stroke." 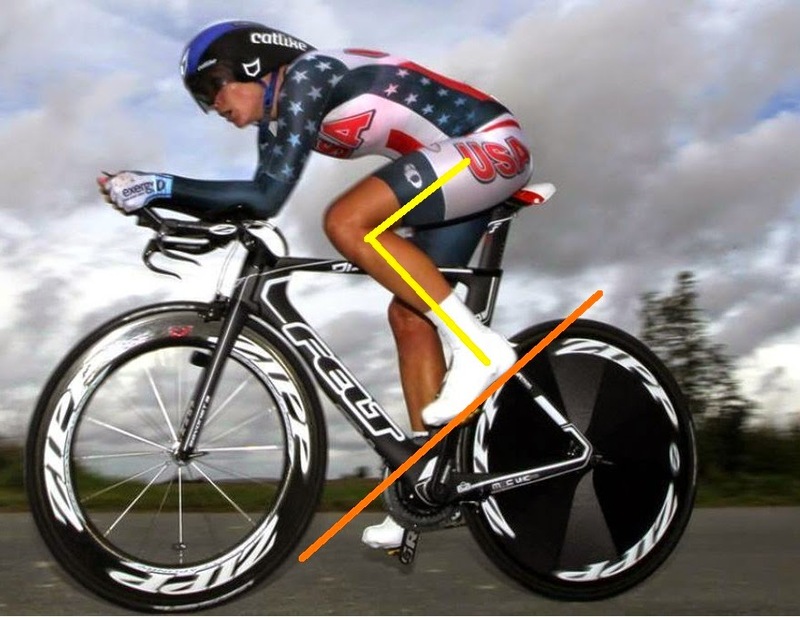 While virtually impossible to keep your foot completely flat throughout the pedal stroke, purposely pointing your toes will result in the calf muscle being shortened (being deactivated), not allowing for proper power. Your foot should never really move more than 20degrees from flat (1), This means your foot and lower leg essentially form a right angle relationship to each other. Don't let your eye deceive you when you watch the pro's ride either. They tend to be much more prone than our general population indoor cyclists. This prone position means the relationship between their foot and the pedal stroke still maintains the flat position (right angle to each other), although it's different than comparing it to the ground. In the image to the right it would appear the rider is pointing her toe as xhe comes over the top, but reality is that xhe is still maintaining a perpendicular to her hip. Now ask yourself, are any of your riders really that prone? No? Then they should be trying to maintain a flat foot (relative to the ground). My sub announced to the class after the 55 minutes, congratulations you just completed 22 miles and burned 750 calories. If you've ever rode a real bike you know that 22 mph is a pretty good clip. In other words much faster than most will do, let alone able to maintain for an entire hour. And did you do any hills during that 55 minute cycling class? The real answer is, ZERO. Your bike is in the exact same position as it started out, and it's virtually impossible to equate your studio efforts to real word DISTANCES. That's what watt meters are about, and then you run into the question, "Are all watts the same?" (Short answer is no as it depends on how the bike meter measures this). 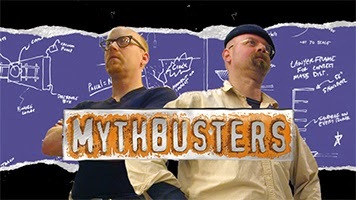 Having said all this, and knowing that our general populations want to equate their effort to an understandable distance such as miles or kilometers, I generally say 10-15 miles for one of my strength classes and 12-17 miles for an interval class. Still think you just completed a 22 mile ride in that hour long ride? The participants come to our classes because they want motivation and inspiration, but they also assume that we're providing them accurate and safe routines. Be the professional you are and continue to educate yourself.